In one paragraph, Luke introduces Lydia, the first lady converted through Paul’s preaching in Philippi. Lydia owned a business and a home. She hosted Paul and his companions while they were in Philippi. Scholars have studied her name, her business, and her role in the church at Philippi to enhance Luke’s description. Commentators say the lady’s proper name may not have been Lydia. She may have been known as the Lydian woman because she came from the region of Lydia in Asia Minor. Although Lydia might have been her proper name, “it seems more likely that it merely means ‘the Lydian,’ and that it was the designation by which she was originally known in Philippi.”  Some commentators propose that the lady was actually either Euodia or Syntyche referred to in Phil.4:2. Luke identified her as Lydia, a common name for women in Phoenicia at one time, and mentioned no other name for her. Was she a Jew? Based on the words that she was “a worshiper of God,” scholars believe Lydia was not a Jew by birth but was a Jewish proselyte. Lydia kept the Sabbath. She was among the women who assembled by the riverside and heard Paul preach about Jesus Christ. What did it mean to be a “seller of purple”? Did she sell dye? Purple cloth? Purple garments? Scholars say she could have sold any of these items or a combination of them all and be considered a “seller of purple.” One source suggests she sold cloth and garments of deep turkey red, commonly made in her hometown of Thyatira. The remarkable Tyrian purple was made from a secretion of the predatory sea snail, Murex brandaris. 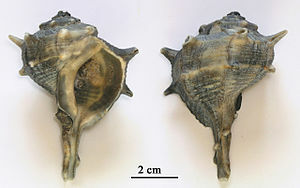 Murex snails flourished in the eastern Mediterranean along the coast of Phoenicia. The Tyrians learned a “secret method of extracting the glandular substance from which dye was produced.” The Roman writer Vitruvius stated that Tyrian “purple exceeds all colors in costliness and superiority of its delightful effect.” Because thousands of snails were crushed to produce a small amount of dye, it was expensive. Until the Murex snails were over-harvested, the wealth of Tyre was based primarily on the manufacture of dye and trade in purple cloth. To summarize, scholars suggest Lydia (the Lydian lady) sold purple fabric that was woven and dyed in Thyatira, from dye manufactured in Tyre. I believe Lydia was a wise and influential person. I think she had good business sense and an eye for quality. I imagine she traveled to Tyre and Thyatira on buying trips and related interesting travel stories. I picture her as competent in what she undertook, thorough in following procedures, and a good negotiator. Posted in Dye, House churches, Lydia, Paul, Purple, Tyre, Uncategorized. Bookmark the permalink.